Okay...it's not exactly Firecracker's recipe. It's Mollie Katzen's, but Firecracker loves to make it and has done it twice! I was introducted to Mollie Katzen's cookbooks via this post on Little Page Turners. If you don't know Little Page Turners, you definitely need to check it out. It's one of my favorites and is kind of a combination children's books/craft blog. Christianne highlights several children's books each week and a fun activity to go along with them. I tried to find "Pretend Soup" in our library system, but for some mysterious reason it wouldn't let me place a hold. It did let me request the sequal "Salad People," though, and so far it's a hit at our house. It has recipes that are easy to have young children help with and the recipes are written in a format easy for young helpers. Firecracker helped me make a whole dinner from it a week or so ago, all from scratch. We had tomato soup, Rainbow Cole Slaw, and focaccia bread. 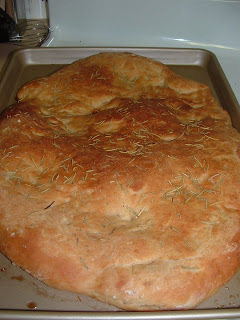 Focaccia bread was Firecracker's favorite to help with because she got to play with the bread dough. 1 1/2 pounds storebought pizza dough...or you can do what we did and make your own, pretty much any basic dough recipe will do. 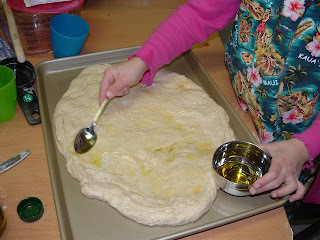 Have your child spread the dough out on the cookie sheet. Bake at 450 degrees for 15 minutes or until golden brown on top and bottom. Remove from oven and brush on more olive oil (we skipped the second brushing) and sprinkle with a little salt. 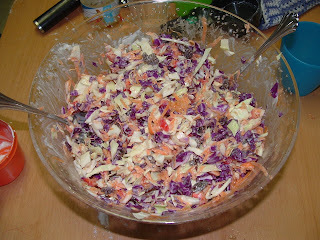 You also might try serving this with this Rainbow Cole Slaw. You can get the details next week when I post the recipe on my weekly Frugal Food Friday post over at The Skinny. Head on over to The Skinny today to see my recipe for Rice and Bean Salad. 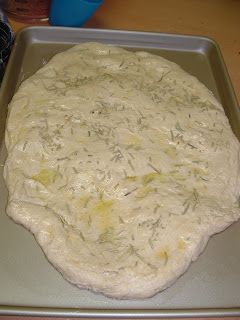 I had no idea it was so easy to make focaccia bread! Yum! Wow, no idea that was so easy. 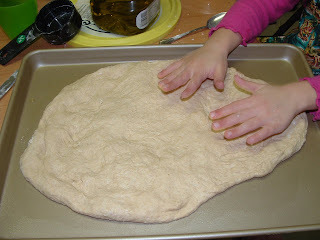 I need to look into this pizza dough phenomenon, I see it all over the place and had no idea it was so versatile. Thank you for sharing this! !